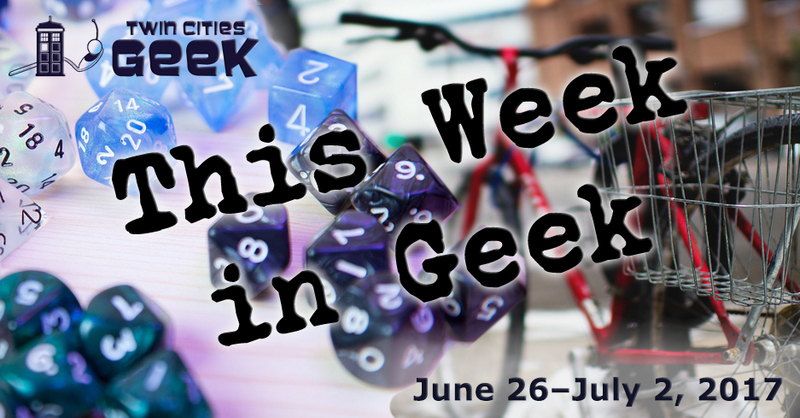 Welcome to This Week in Geek, your guide to events of interest to the Minnesota geek community for the week of Monday, June 26th through Sunday, July 2nd. When: Monday, June 26th at 6:00 p.m. When: Monday, June 26th at 7:00 p.m.
Lea DeLaria may be best known for her excellent work as Big Boo on Orange is the New Black, but she has had a multifaceted career that includes acting, comedy, and jazz. It’s the last one that she’ll be performing at the Dakota in downtown MInneapolis on Monday night. Tickets range from $41 to $62. When: Tuesday, June 27th at 6:00 p.m. When: Tuesday, June 27th at 6:45 p.m.
United Geeks of Gaming will be assembling for Sporcle-based trivia at New Bohemia in Uptown on Tuesday nights. Sporcle is a team-based trivia night with a focus on general trivia, so whatever you geek out about, you may be able to help your team. United Geeks of Gaming has a regular team, and attendees can also form splinter teams or go solo. The trivia itself is free; the food and drinks are not. When: Tuesday, June 27th at 7:00 p.m.
Come and experience YogaQuest, a blend of yoga and fanfiction storytelling led by certified yoga instructors. Experience a yoga workout experience and a story at the same time. This week’s theme is Labyrinth, so prepare yourself for impossible crystal-ball tricks and magic dancing. Stop by Inbound brewery on Wednesday to “grab a beer, some colored pencils, and the coloring sheet design of the day.” Turn in your finished masterpiece with your name and email for the chance to win a free growler of beer. When: Wednesday, June 28th at 7:00 p.m.
Come to Common Good Books for a reading of I’d Die for You:And Other Lost Stories, a collection that features previously unpublished writing by F. Scott Fitzgerald. This evening is presented by Anne Margaret Daniel, the editor of the work, and scheduled in conjunction with the 14th International F. Scott Fitzgerald Society Conference. Clockwerks Brewing presents the second installment of Tabletop Tester Night, a series in which they invite local game designers to lead guests in playing a new game. This month is Hounded, by local designer and film-maker Clint Bohaty. Can you outfox the hounds? When: Wednesday, June 28th at 9:00 p.m. The Minneapolis Park and Recreation Board is presenting movies in various parks throughout the city over the course of the summer, and one of the screenings this week is The Princess Bride, a tale of swashbuckling adventure, embellishment, and love. This free showing begins 15 minutes after sundown. When: Thursday, June 29th at 6:30 p.m. When: Thursday, June 29nd at 7:00 p.m. When: Thursday, June 29th at 8:00 p.m.
Another event at Clockwerks Brewing this week represents the convergence of two geeky favorites: a steampunk-themed bar and absurd trivia. This event is hosted by Sam Spadino and Sidney Oxborough. When: Thursday, June 29th at 9:00 p.m.
Another free outdoor screening this week from the Minneapolis Park and Recreation Board is Back to the Future, a film for DeLorean enthusiasts and time-travel geeks. The showing begins 15 minutes after sundown. When: Friday, June 30th at 3:00 p.m. to Saturday, July 1st at 4:00 p.m. The 27th annual Twin Cities Antiquarian Book Fair brings dozens of sellers of “first editions, fine bindings, children’s books, local history, vintage books and advertising, ephemera, maps and more” to the fairgrounds. There will also be speakers from the Quatrefoil Library, the Minneapolis Athenaeum, and Twin Cities Sisters in Crime. Friday admission covers both days; Saturday-only entrance is also available. When: Friday, June 30th at 6:00 p.m. When: Friday, June 30th at 8:00 p.m. and Saturday, July 1st at 3:00 and 8:00 p.m. When: Friday, July 30th at 10:00 p.m. When: Saturday, July 1st at 10:00 a.m. When: Saturday, July 1st at 7:00 p.m.
Take in a short and sweet presentation about the history of Tarot presented by Jeanette Roth of the Tarot Garden. See rare Tarot decks and learn. When: Saturday, July 1st at 9:15 p.m. Yet another free outdoor movie screening this week will be shown at Como Dockside and is first-come first-serve for seating. The movie will be an old geek favorite, Star Wars Episode VI: Return of The Jedi, and we promise that it’s not a trap. The venue has seating for roughly 300 people, but capacity for around 700, so feel free to bring picnic blankets and chairs. May the force be with you. When: Saturday, July 1st at 10:30 p.m.
Come see great local actors perform a live staging of Galaxy Quest based on the film, with comedy, music, and drinking. Galaxy Quest is a work that means a lot to many members of geeky fandoms, because it only effectively parodies Star Trek out of a real sense of love for the work. This is an all-ages event, but obviously participants who intend to take part in the drinking game portion need to be of age. Tickets are $8.50 online. When: Sunday, July 2nd at 11:00 a.m. Celebrate the beginning of Sunday liquor sales in Minnesota with Tangletown Bike Shop and South Lyndale Liquors. Try out some cool demo bikes, legally buy beer, and grab a bite to eat. The far-future utopia where people don’t drive to Wisconsin on Sunday for beers is almost here. When: Sunday, July 2nd at 4:00 p.m.
Lightsaber group the Saber Legion hosts meets at USA Karate. Come on down to just check it out, or get involved in formwork, dueling or sparring to get your Jedi on. See the website for protective gear requirements and rules for this demanding and geeky martial art. There is a monthly fee of $10 for use of the space.